Journalism and business students have won an international award for a social media project in the Decoding Social Media course. They received an Excellence in New Communication Award from the Society for New Communication Research, a global non-profit research and education foundation and think tank. The awards honour excellence in new communications, digital, mobile, social media and information and communications technology developments. The students took the Social Media Marketing award in the academic category for a campaign created for Vancouver Magazine as part of the course. The pioneering course partnered journalism students with colleagues from the UBC Sauder School of Business to research and develop strategic social media plans for major news outlets like the Vancouver Sun and CBC Music. The winning team was made up of journalism students Suzanne Ahearne, Mike Wallberg and Sachi Wickramasinghe, and business students Lisa Andrews and Whitney Lindskog. They worked on a plan for the magazine’s annual restaurant awards, under the direction of professors Alfred Hermida and Paul Cubbon. 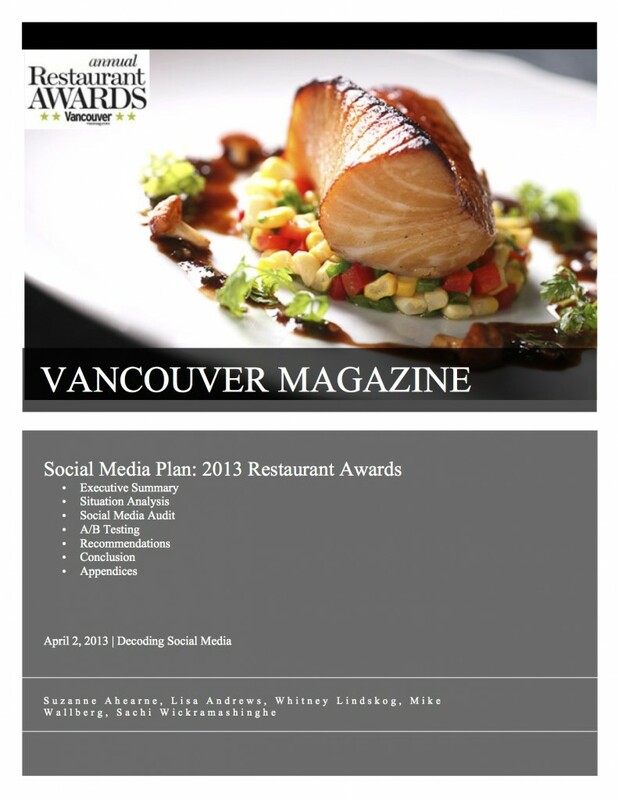 The social media project is also up for a Canadian Online Publishing Award (COPA) for Best Use of Social Media. The COPA winners will be announced at a November 13th awards party in Toronto. In 2010, UBC Journalism won a SNCR Commendation of Merit for a collaboration between UBC and CBC Music, led by journalism student Amanda Ash. 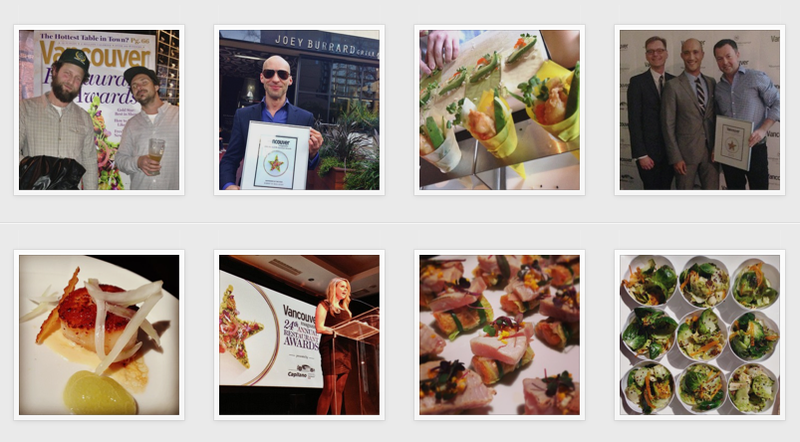 Vancouver Magazine’s annual Vancouver Restaurant Awards is an invitation-only event for some 750 food critics, influential food bloggers, and restaurant industry professionals. The following month’s issue is the most popular of the year. Students created a diverse plan that recommended social listening and response, the use of Instagram for food-related photos, dedicated hashtags and live coverage of the awards on multiple social networks. On the night of the restaurant awards, the hashtag became a trending topic and generated more than 1,700 tweets in two days. Potential impressions exceeded four million and sentiment was strongly positive. Unique visitors to the magazine’s awards page jumped 42% over the previous year. The Society for New Communications Research is dedicated to the advanced study of the latest developments in new and emerging communications technologies. The awards recognise the work of corporations, governmental and non-profit organisations, educational institutions, media organisations and individuals who are innovating the use of digital and social media, mobile media, collaborative technologies and other technologies to improve business, culture and society. Awards are granted in six divisions: Academic, Corporate, Government, Media, Nonprofit/NGO, and Technology Innovation, and eight categories: Internal Communications, Online Community, Mobile Media, Social CRM, Social Intelligence, Social Media Marketing, Visual Media, and Technology Innovation/Best New Technology. The award winners were announced on November 7 at a symposium and awards gala in Boston.